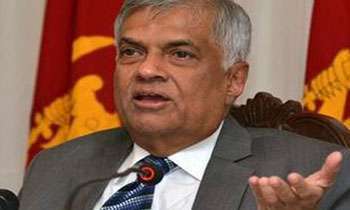 UNP leader Ranil Wckremesinghe in a letter to the President said he was the constitutionally appointed Prime Minister and continues in that office. He said he commanded the confidence of Parliament as contemplated in Article 42 (4) of the Constitution. How do you know? You represent the people??? If you want to be PM, have an election. Let's see what the people say. Pls Mr Ranil go. Go gracefully. I hope u read what Mr. Wasantha Senanayake’s press release. U n yr clique made the citizens of Sri Lanka destitute. B4 v start cursing u more pls vanish from the scene. That is true, but prisident has the power lift off your position. Let see confidence Morrison of MR in parliament. That is all of your dream and keep the Oposisition leader post. Nobody has the power to remove RW, other than the Parlament. People should come out on the streets and protest against the Sirisena and the gang. Did I say yesterday, "stay dogs need to be shot dead on sight"? Well said Ranil ,,stick to your guns,,,,economic mess was brought by Mahinda and Sirisena in previous Govt by unwanted debt burdens,,now blaming others for it..
Dont give in,,,tell speaker to have a vote in parliament and see who has the majority in parliament,,,Sirisena cant play the fool and appoint all and sundry who were rejected by teh people and who dont have a majority in parliament....who si Sirisena,,,he should be impeached for this act and sent home..
Will Sri Lanka become a LIVING HELL because of POLITRICKS. ? . now get out from unp. RW has demonstrated that he is a successful failure, whereas MR has proved success beyond any doubt. You can think of Ranil as you like, but he is the rightful Prime Minister and not this nefarious criminal. Mr.President has shown his true color to Sri Lankan including Tamils and the world. There is no need to prove that his good governance promises are tactic to convince people to vote for him. UN resolution is proven to be meaningless.